Riad of charm any comfort with swimming pool without opposite and big sported garden. 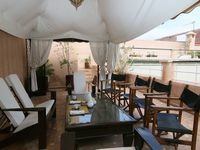 Property 16: Riad of charm any comfort with swimming pool without opposite and big sported garden. Property 28: Traditional house of charm any comfort with swimming pool without vis-à-vis. un mot: Fantastique. le personnel est attentionn&eacute; et la cuisine est excellente!